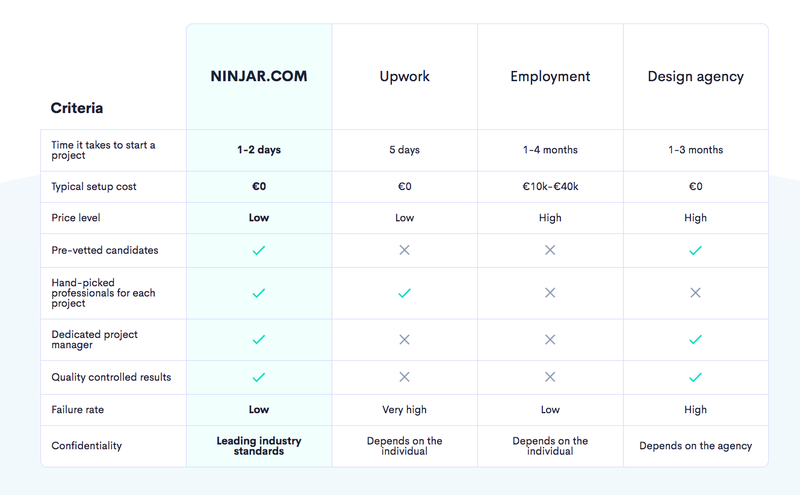 We at NINJAR are the fastest and easiest way to build custom, cutting-edge software solutions. Innovative technological expertise delivered at a moment’s notice for a fair budget. In this new digital world, lots of people want to create innovative 3D / AR / VR software products. But very few people have access to quality development at a reasonable cost or can’t even get consistently high quality software using top talent. Our team spent seven years creating innovative digital products. During this time, we were lucky to establish and collaborate with a network of world-class developers, designers, and product managers to create beautiful, functional software. We experienced the difficulties that most entrepreneurs do; first finding great developers and then having to manage the development process. Sure, there are thousands of development services, from foreign talent marketplaces like Upwork, to professional development shops, but from our experience they just don’t do the job. Either the price tends to be too high or on the other side of the spectrum, the quality too low. So we wanted to strike a new balance — high quality at fair prices. We wanted to end up with a process that takes the hassle out of building software, instead of bringing even more hassle for all parties involved. Our mission was to create a large network of exceptional developers, designers, and product managers which we’ve armed with technology-powered automation tools to ensure project efficiency and success. We have completely re-shaped the development process — one which we can trust every single time. From today on, we want to share and scale our expertise and aim to put a 3D / AR / VR software development team in everyone’s pocket. We believe software is an essential tool for every individual in the world, and by democratizing access to great software, we are increasing the pace of digital innovation and human evolution. Our unique platform-optimized development model means higher quality, lower costs, and a better experience. Over the next months, we will work on making this come true by launching our proprietary smart work platform, leveraging elite talent with technology-powered automation tools to make software development more reliable and efficient. We will be writing part two of this post, and many more parts, as we move forward.